Things do change….sometimes for the better. And if you live long enough, you’ll find the saying is true: what goes around comes around. Restaurants live and die, among other things, on the quality of their product and the quality of their service. When they deliver delicious food in conjunction with legendary service, restaurants are rewarded with loyal fans who not only return time and time again but also evangelize the brand to all who will listen. You can find many such restaurants across the great state of SC — which is arguably the birthplace of barbecue. Lose focus on product and service, however, and in return, those once loyal fans stop coming and may even begin to malign the company’s name. Such has been the experience for one of SC’s biggest BBQ brands: Sticky Fingers. The iconic SC-based barbecue chain with locations across the Southeast is currently celebrating its 25th year. At the time of this writing, there are seven restaurants in SC: Mt. Pleasant on Johnnie Dodds Blvd., Downtown Charleston on Meeting St., Summerville on N. Main St., Myrtle Beach on Coastal Grand Circle, North Myrtle Beach on Highway 17 S, Greenville on Market Point Dr., and Greenville on South Main. While all those years haven’t been golden, a great many of them were, and Sticky Fingers worked hard to earn its stellar reputation in the early years. Sticky Fingers was founded in Mount Pleasant in 1992 by Jeff Goldstein, Todd Eischeid, and Chad Walldorf, who grew up as friends after meeting in seventh grade in Chattanooga, TN. 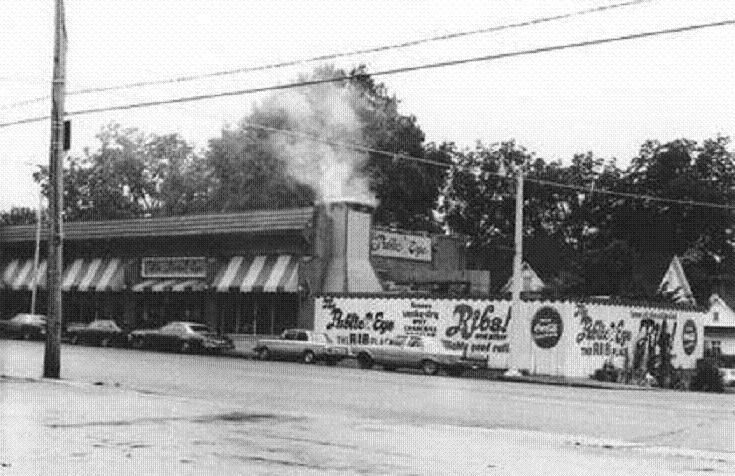 After college, Goldstein worked for his father at a Memphis BBQ landmark. In 1992, his parents decided to move to his mother’s hometown, Charleston. Upon arrival, it was obvious there was a hole Charleston’s culinary options: no one was serving Memphis-style BBQ. That’s when Goldstein called up his high school buddies, and Sticky Fingers was born. Early on, the trio worked crazy hours, learning as they went, but two things were central to their work: legendary service and quality BBQ. Because they were all in it together — not only Goldstein, Eischeid, and Walldorf, but all their crew — a culture of togetherness evolved. Everyone one had one another’s back. Those are the elements that would carry Sticky Fingers for the next 14 years, from a small startup in Mount Pleasant to some of the best BBQ in SC to a big Southeastern brand. 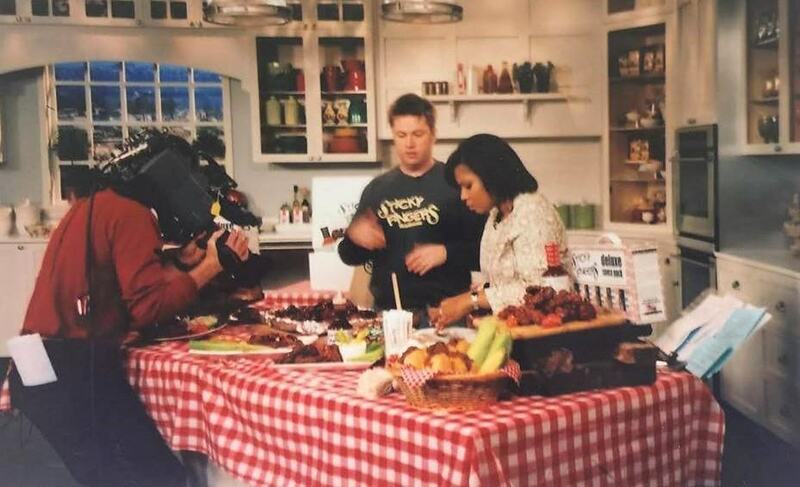 Times were good, with US Presidents dropping in for take out, and a new line of sauces rolling off the production line, making it even to the Home Shopping Network (HSN). 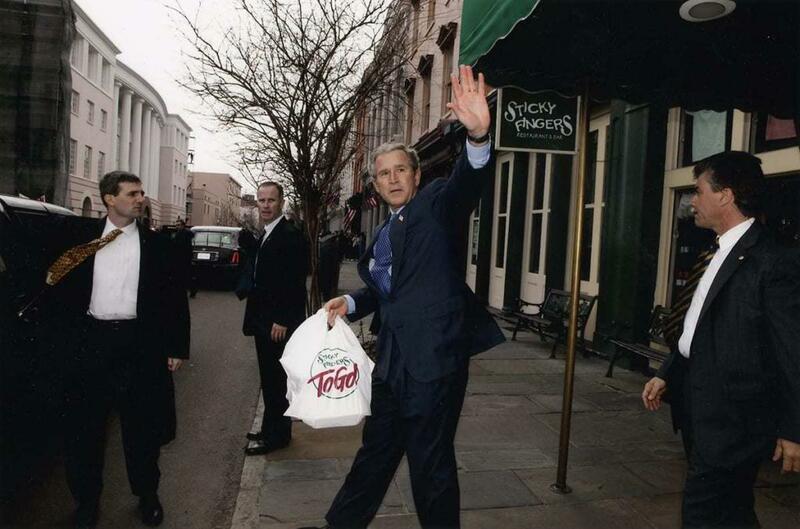 President George W. Bush gets Sticky Fingers to go in 2003. Our purchasing manager Dave Lorenz on the Home Shopping Network (around 2005). Dave opened and now runs the Mex One restaurants in Charleston. But with that growth came complication: 14 locations, 100’s of employees, and life outside of work became so complex and exhausting that the three decided it was in the best interest of Sticky Fingers to let a company with more experience steer the ship. In 2006, Charlottesville-based Quad-C Management bought into the company, took over management, and expanded the brand. The problem with that, of course, is that with the change came change, and most of it was not for the better. If you know Sticky Fingers’ story, you probably know what happened next: quality slipped and that legendary service didn’t live up to its name. With the slip, those once evangelical customers stopped crusading….and then stopped coming. Equipment and ambiance fell behind the times. The banks took over….that didn’t help. Time passed and reputation eroded, but Sticky Fingers steadfast employees maintained as well as they could in the circumstances. In 2016, Sticky Fingers stepped out of the clutches of the banks, and Walldorf returned to help direct Sticky Fingers back to its former greatness. With an emphasis on recapturing the culture of the original Sticky Fingers workforce and providing those workers with the tools to do their jobs with enthusiasm, Walldorf works to support them so they can create a great experience for the customer. In an “Open Letter” written shortly after his return, Walldorf takes an honest look at the problems the company faced and the fact they had lost sight of what made them great from the start. More importantly, he acknowledges that they had disappointed customers and promised to set things right. You know how a Bush, a Clinton, and that eccentric, headline-grabbing rich guy all ran for president? No, not last year, but a full quarter-century ago when Bill Clinton defeated then President Bush and billionaire Ross Perot to win the White House. Boy, how times changed over the last 25 years. Well, at least somewhat…. 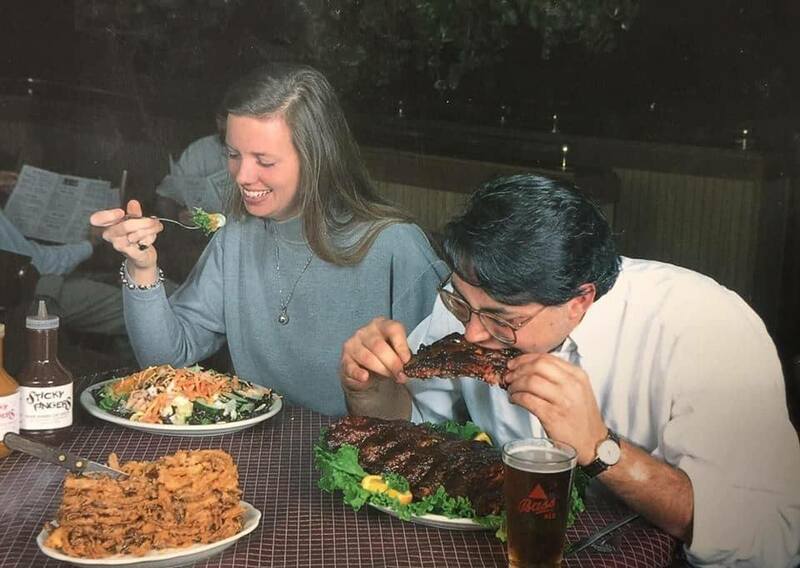 1992 was the year that I moved from my hometown in Tennessee to South Carolina with two high school buddies (Todd Eischeid and Jeff Goldstein) to start a rib restaurant we named Sticky Fingers. We knew a bit about cooking Memphis style ribs, wings, and barbecue, and we were raised to try and treat people well – but we were young and frankly didn’t know much else. Over the next 15 years, we grew our little company through trial and lots of error and with the help of some incredible team members and great customers. We focused on providing legendary customer service, preparing incredible barbecue and making sure to be good corporate citizens. In retrospect, we had a really good run with it. Ten years ago, we sold our company to some good folks… good folks who brought in some not-so-good management. Things declined. Quickly. At one point, Sticky Fingers was even owned by its lenders. While no offense is meant to any friends in the banking industry, banks aren’t usually known for providing timely, legendary service. Various management teams also moved the company’s offices to towns around the Southeast – whether those towns had a Sticky Fingers restaurant nearby or not. Yikes! Over the past 10 years, many of Sticky’s good employees left, as did some of our loyal customers. We think we understand why – it’s mainly because the emphasis shifted from being obsessively focused on our customers and our employees to being focused on… Well, I’m not sure where the focus went. Sticky got away from its roots in almost every way. Trust me, it was hard to watch it happen to the brand we built, the culture we helped create and the people we cared about. Then about a year ago, I was asked to consider returning to help bring Sticky Fingers back to its glory days. After a decade of declining sales and morale, I honestly wasn’t sure there was enough “there” there, but I knew I had to find out. First, how far we have fallen, in so many ways – our buildings and equipment were neglected, our menu and our brand had no focus, and our team was suffering from a major lack of support. I was horrified… and heartbroken. Secondly, I was surprised by the familiar faces…the number of Sticky team members and loyal customers who were still with us despite some really bad times. And these team members (as well as many I didn’t recognize) we’re still providing legendary service even when they didn’t have the tools provided to them to do so. I was also very happy to find that the food was still incredible – just not always consistently so. In short, the Sticky spirit I remembered was still there and the brand was still glowing although somewhat tarnished. So I agreed to come back to try to help to bring Sticky Fingers back to the glory days. Over the past year, hundreds of us have put tens of thousands of hours into improving every facet of the Sticky Fingers’ experience. It’s often been messy and rarely easy. I think we’ve improved virtually everything we do with more improvements coming every day. We’ve done it collaboratively with the best ideas from our team members and our customers. Just like we did in the old days. We have come a long way but still have more to do, so I would truly love to hear any suggestions, thoughts or ideas you have, so please feel free to email me anytime at [email protected]. As we embark on our 25th birthday celebration, I want to first thank all of our current and former teammates who’ve given so much time, energy and attitude into making Sticky Fingers great – with a special shout out to those who stuck with this during some rough times. I hope that when you visit, you will agree that at Sticky Fingers we are getting our mojo back. Service, food quality, morale and sales are all on the upswing. I think you will see a friendlier smile from your host or hostesses, see an extra bounce in the step of your server, and taste of pride in our food from our excellent pit masters. We are focused on taking care of our customers and our team members again. We have returned to doing what we do best – providing legendary service with incredible ribs, wings, and barbecue. This year, we will celebrate our quarter-century by remembering what makes Sticky Fingers special. And while we will look back on some great times from the past, we’ll mostly be focused on the future. While we don’t have a Bush or a Clinton back in the White House, Sticky Fingers is “back” 25 years after we begun. We hope that you will join us as we celebrate our silver birthday throughout the year. Stay sticky… And, as always, have fun! I, myself, have to say I have noticed a difference. Our only Sticky Fingers review was not very flattering….but it was from an era before Walldorf’s return. Our son plays for the Wando baseball team, a team that Sticky Fingers has a long history of supporting. At the season-ending banquet for the 2017 season, Sticky Fingers provided the venue and catered the event (both for free, I believe). Venue provided by Sticky Fingers for the Wando baseball team banquet in May 2017. When the time came to eat, waiting in line, I was immediately struck by what I saw on the plates passing by. When I got my plate and was able to sample it, the food did not disappoint. In fact, it was actually fantastic. The meat was tender and juicy. The color was perfect, and there was not a slab of fat to ruin a mouthful. 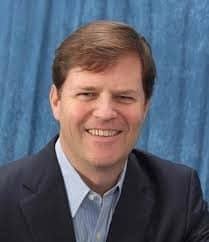 When I later read about Walldorf’s return and found his open letter on their website, I knew I had to reach out and share my experience with him. After doing so, I knew I wanted to share this story with you. How did you and your buddies end up in Charleston to start what would be Sticky Fingers? I grew up in Chattanooga, TN. My high school friend Jeff Goldstein’s mom is from Charleston. She and her husband were moving back to her hometown in 1991 shortly after we graduated from school. Her husband had been a partner in The Public Eye, a prominent BBQ place in Memphis. When he saw there were no Memphis style rib restaurants in Charleston, he offered to help his son Jeff open one. Jeff called Todd and me, so we also moved to help out. Jeff came up with it…seemed appropriate for a rib restaurant. Plus, we were all fans of the Rolling Stones who had a classic album called Sticky Fingers. Bill Wyman of the Stones actually has a Sticky Fingers café in London and owned the rights to the name in the states when we opened. Rolling Stone’s famous Sticky Fingers album cover. We found that out, but went for it anyway thinking it would be fun to get noticed by the Stones (did I mention we were right out of school and not that smart?). At one point, his attorney’s sent us a cease and desist letter which suddenly didn’t seem fun, but at some point, he let the name lapse and we were able to get the legal rights to it. Better to be lucky than smart sometimes, I guess. We didn’t have the domain www.stickyfingers.com either for a number of years….but that’s another story! Talk about the early years and then why eventually you chose to sell. As every restaurateur knows, opening a new place is a crazy….especially when you don’t know what you are doing! We made up for our lack of experience by working our tails off and trying to be super nice to everyone, so the three of us were working 90 hour weeks for years. When we started, one of us ran the kitchen, one the dining room, and the third did the accounting and relieved the other two. Every six months, we would rotate jobs, so after a year and a half, we had each done every job for a while. So we opened our second restaurant (in Summerville), and then a third two years later. 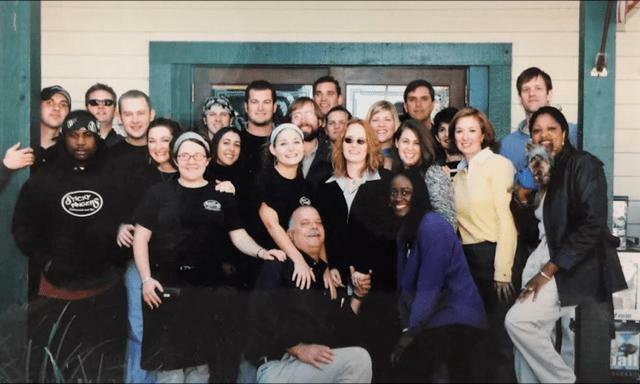 And then we started opening restaurants out-of-town (starting with back in our original hometown of Chattanooga) with friends and employees as partners. 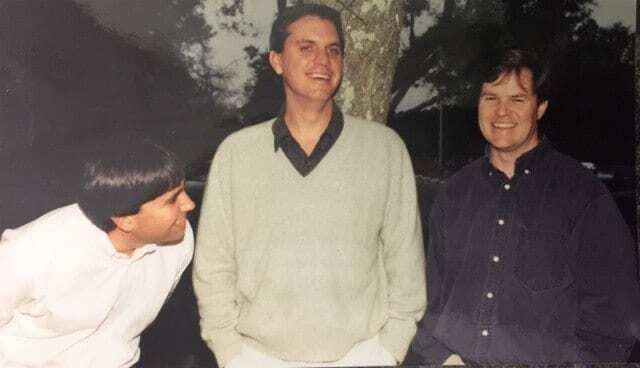 Flash forward fourteen years after starting and we had about 1000 employees in 14 locations around the Southeast and our sauce in several thousand grocery stores. We also all three had our first children from recent marriages and severe exhaustion….so we decided it was time to sell to someone who could better manage the brand and what had become a bigger-than-we-could-handle company. Sticky Fingers’ first marketing photo showing then floor manager and his girlfriend (Patrick “Packy” Runey and his now wife Stacey). They now own TW Graham and Co in McClellanville. After selling, were you still involved in the business in any active role? We were on the board for a little while after selling, but the new management team wasn’t very interested in our opinion as they tried to “professionalize” what had been a network of friends running affiliated but somewhat unique Sticky Fingers restaurants. Talk about what happened in the interim and then being asked to return. The new management team opened more restaurants but pretty quickly killed the casual culture that we had built and tried to expand the brand with new menu items. Over-time, many good long-term employees quit and others quit caring as much as they had before. Not surprisingly, customers noticed and sales and profits declined. When the recession hit in 2008, the company was losing lots of money and the lenders took it over for a couple of years. Banks are good at some things, but running restaurants is not one of them. Did you return alone or are Todd and/or Jeff back as well? I am the only founder who returned but remain great friends with Jeff and Todd, so I regularly get their feedback. What made you want to come back and accept the burden of rebuilding? People. First off, there were some great folks still working at Sticky Fingers who just needed a new management team that would support them. Second, I really liked the new owners and thought they “got it” in terms of supporting the folks running our restaurants. The opportunity to be the bridge between the two (good owners and good restaurant-level managers) was compelling. And finally, it had been tough to be on the sidelines while Sticky Fingers was in decline. So I was happy to finally be a part of the solution. Are you overseeing ALL the Sticky Fingers locations or just some? Yes, I am helping with all 12 remaining Sticky Fingers…although rather than “overseeing” feel like more role is “supporting” all of the restaurants which is why I’ve taken the tile of Chief Support Officer. Talk about the initial changes you made and how those came about. We’ve changed almost everything so I’m not sure where to start. My first day back I washed dishes in our original restaurant (Mt Pleasant), and one of our long-time kitchen guys suggested we bring back our onion loaf appetizer that came off the menu years ago. It’s back, but the biggest menu changes were dropping non-barbecue menu items that we didn’t do as well as we’ve tried to refocus the brand. I hope that the biggest changes have been in terms of “getting the backs” of our folks in the restaurant and giving them the equipment and support they need to take care of our customers. Most of them frankly came about after suggestions from our employees. You hit that nail on the head with the second part of your next question. How difficult has it been to win back the hearts and confidence of the Sticky Fingers employees? customers? I think our team was eager to believe in a new direction and that we had our backs….it had really been bad for a while, so once we started doing what we said we were going to do and made it clear to them that they had the power to make changes, I think we got the employee’s confidence back pretty quickly. It is obviously much tougher to win customers back after they’ve had a bad experience or two, but we’ve been honest with them about our previous shortcomings and asked them to give us another shot. But it takes time…and there are some we will never win back. Tell me about the ﬁrst experience when you knew you were on the right path. I was pretty unsure that first night back washing dishes. But when I asked everyone for suggestions and Brian told me we should bring back the onion loaf, it felt right. And later that night, when I asked the manager to get a pitcher of beer for the kitchen crew while they cleaned up he told me it was against company policy….but then excitedly corrected himself and said, “but I guess you just changed the company policy, huh?” That felt good. Well I’m guessing some of the folks reading this are fellow restauranteurs, so first I want them to know I respect what they do….this is a tough industry, and there is a lot of great barbecue, so I appreciate what they do. As for the general public, I am hoping they will give Sticky Fingers a shot if they haven’t been in for a while as I think we are doing things the right way again. And that brings us back to where we started: what goes around, comes around. Once upon a time, Sticky Fingers was indeed the stuff of legend, but time and poor management tarnished that once unsullied reputation. And today — if you haven’t been back in a couple of years — you may find yourself not even considering Sticky Fingers when you’re thinking of BBQ. You’re wrong….just like I said at the beginning, and just like I was to assume the same. Sticky Fingers has changed, and for having the (Rolling) Stones to make a change, we believe you should give them another shot. 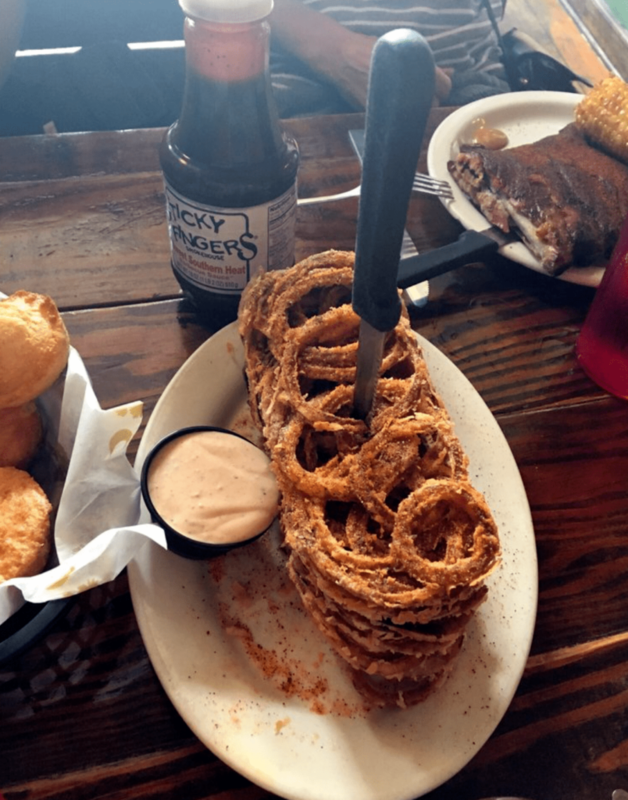 So next time you hit the road looking for your next bite of SCBBQ, consider Sticky Fingers. We think you’ll find Sticky Fingers to be…..well, legendary.